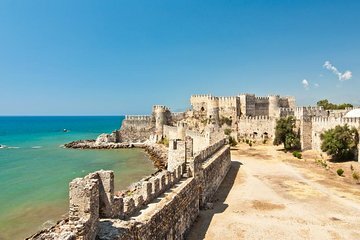 Take a private full-day tour to Anamur to see the ruins of the ancient city of Anemurium and Mamure Castle, located at a scenic spot on the Mediterranean Sea. Learn from your guide about the history of the region on a tour that includes lunch, private transportation, and hotel pickup and drop-off from Side and surroundings. Start your day with morning pickup at your hotel in Side or nearby towns, then travel in your private vehicle along the coast to Anamur. Take in sweeping views of the Mediterranean Sea on one side and banana fields on the other, and stop to purchase fresh bananas if you like. Upon arrival in Anamur after the drive, visit the ancient city of Anemurium and Mamure Castle. Built during the Roman and Byzantine Empires, the Anemurium ruins rival Ephesus for beauty, but are not as crowded. See the theater, public baths, ancient mosaics, and a necropolis that sits in the hills. After sightseeing, have lunch in Anamur at a restaurant overlooking the city. Afterward, have time to go to the beach and take a refreshing dip in the Mediterranean. Next up, head to Mamure Castle, which dates back to the Seljuk dynasty (1037-1194). Walk among the fortified walls and 36 towers, and look for sea turtles on the beach behind the castle ruins. In the afternoon, your driver returns you to your hotel in Side to end your tour.